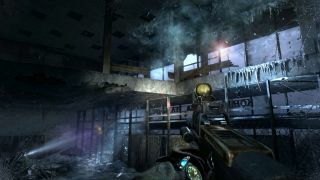 We've already shown you what Metro 2033 Redux looks like when put side-by-side with the original, but the game looks so darn pretty that we wanted to spend more time in post-apocalyptic Moscow. We fed it to that benevolent giant we call the Large Pixel Collider and ran it on max settings at 2560x1440 resolution, and what do you know—a video came out!. You can also check out our review of Metro 2033 Redux here. Want more from the LPC video archive? Recently we've hit Deus Ex, NeoTokyo, Watch Dogs, Wolfenstein: The New Order, the Titanfall beta, Max Payne 3, Metro: Last Light, and Arma 3. There's much more to come. Have a game in mind you'd like to see the LPC take on at ultra settings? Tell the LPC directly on Twitter.